Netgear's indoor security camera follows the Nest Cam blueprint, perhaps a little too closely. Netgear launched itself into the home security camera space last year with its wireless-and weatherproof Arlo HD camera. Though it was a hit, the device made a number of concessions, including lower resolution, to enable its indoor/outdoor flexibility. 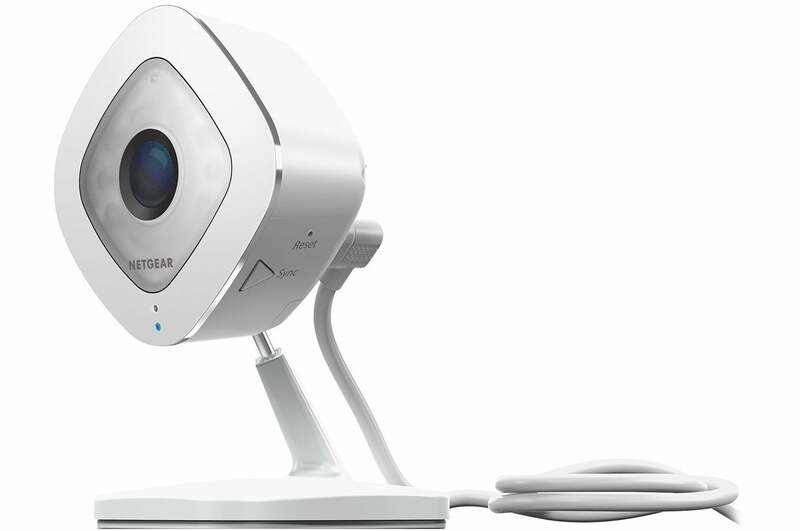 Now Netgear has returned with the Arlo Q, a full-featured indoor camera, to take on the Nest Cam and its many imitators. But though it can certainly hold its own with that darling of DIY security, it sticks a little too close to Nest Labs’ blueprint to stand out. Cosmetically, the the diamond-headed Arlo Q has a little in common with the pod-like Arlo. Functionally, the two cameras are even less alike. The original outdoor Arlo is battery-driven, but Arlo Q is purely AC powered. Tethering the camera to an outlet was necessary to enable de rigueur indoor-camera features such as 1080p HD video, 4MP still shots, and (optional) continuous video recording. And unlike the video-only Arlo, the Arlo Q includes a built-in mic and speaker, a popular home-cam feature for remotely communicating with pets, children, and anyone else you may be monitoring at home. The Arlo Q has little in common with the original Arlo. Overall, the Arlo Q sticks pretty close to the Nest Cam’s security script. It offers a 130-degree viewing angle—plenty enough to see into the corners of any room—infrared night vision up to 25 feet, and motion and sound alerts. The camera’s streaming feed can be accessed through either the Arlo app or a web portal. For $10 per month or $100 per year, Netgear’s Premier service plan bumps the storage that up to 10GB of video clips from as many as 10 Arlo cameras for up to 30 days. The Elite plan pushes it even further, to 60 days of storage and a maximum of 100GB of clips from up to 15 cameras for $15 per month or $149 per year. Netgear also offers a continuous video recording option in which the camera records 24/7 rather than just when an event is detected. That plan costs $10 per month and includes up to 14 days of storage. Each additional camera adds 50 percent to the subscription fee. The plug-and-play promise of most IP cameras frequently belies a more complicated setup involving QR codes that won’t scan or the manual entry of barely legible serial numbers. Arlo Q is refreshingly easy to get up and running. I just followed the step-by-step prompts to connect the camera to my W-Fi network and I had a live view of my living room in less than five minutes. The Arlo app, which can be used with both the Arlo Q and the original Arlo, offers everything we’ve come to expect from home security camera software. Beneath the live feed window are controls for managing the camera’s audio, taking a screenshot of the feed, and manually starting a recording. From the menu at the bottom of the home screen, you can toggle between multiple cameras, view a library of your video clips, and access camera controls. One of the unwelcome byproducts of IP security cameras such as this is frequent false alerts, triggered by incidental sound and motion, such as fluttering curtains or a pet passing in the camera’s view. Arlo Q offers a few common solutions for minimizing these. You can view multiple cameras in the Arlo app. The first is Activity Zones, a feature that lets you define sound- and motion-detection areas by drawing a square with your finger over the camera image. This reduces false alarms by focusing the camera’s sensor on, say, just an entry point to your home (a patio door, say, instead of an entire room). Even if the family cat passes in the camera’s field of view, it will be ignored if it’s not within that activity zone. The other feature is Modes. These are sets of rules that tell your camera how to respond when it detects sound and/or motion. Arlo Q comes with three default Modes: armed, disarmed, and schedule. The first two allow you to turn sound and motion detection on and off, while the third lets you schedule it for specific days and times. You can also create custom Modes. 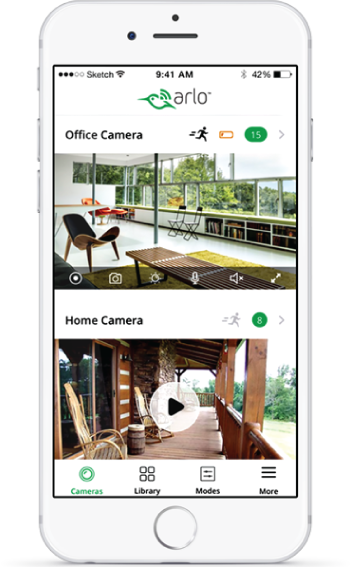 If you’re running multiple cameras, for example, you can set your Arlo system to record videos when the motion is detected by one specific camera and send you an email alert. Custom Modes give you the greatest control as they let you incorporate activity zones and adjust the camera’s motion and audio sensitivity. Other definable settings include the Arlo Q’s response (record video, take a snapshot, or do nothing), the length of the recording, and the type of alert you receive (push notification or email). The best thing I can say about Arlo Q is that everything worked as advertised. Live streaming and video playback were crisp in both day and night mode, and alerts were timely and accurate. The camera’s customizable features let me tailor security to my particular needs. But nothing about the Arlo Q was knock-your-socks-off impressive. There are no cutting-edge features like Simplicam’s facial recognition or MyFox’s privacy shutter and IFTTT integration. Even with its generous basic cloud storage plan, it’s hard to see how Netgear plans to differentiate Arlo Q from the glut of samey home security cameras. Arlo Q might not be the most imaginative entry in the home security camera space, but it does have top-notch specs. If “simple” and “straightforward” are the traits you prize most, this camera won’t disappoint. Still, with several other models offering a little more for less, you probably owe it to yourself to shop around first before settling for this safe choice. This is a solid camera with that won’t disappoint if you’re looking for straightforward security.